After founding the Ford Motor Company, the American industrialist Henry Ford developed a system of mass production based on the assembly line and the conveyor belt which produced low-priced cars that were affordable to middleclass Americans. 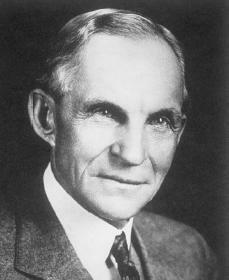 The oldest of six children, Henry Ford was born on July 30, 1863, on a prosperous farm near Dearborn, Michigan. He attended school until the age of fifteen, at which time he developed a dislike of farm life and a fascination for machinery. He had little interest in school and was a poor student. He never learned to spell or to read well. Ford would write using only the simplest of sentences. He instead preferred to work with mechanical objects, particularly watches. He repaired his first watch when he was thirteen years old, and would continue to repair watches for enjoyment throughout his life. Although he did not like working on the farm, he did learn that there was great value in working hard and being responsible. In 1879 Ford left for Detroit, Michigan, to become an apprentice (a person who works for another to learn a specific skill or trade) at a machine shop. He then moved to the Detroit Drydock Company. During his apprenticeship he received $2.50 a week, but room and board cost $3.50 so he labored nights repairing clocks and watches. He later worked for Westinghouse, locating and repairing road engines. Ford's father wanted him to be a farmer and offered him forty acres of timberland, provided he give up machinery. Ford accepted the proposal, then built a first-class machinist's workshop on the property. His father was disappointed, but Ford did use the two years on the farm to win a bride, Clara Bryant. Ford began to spend more and more time in Detroit working for the Edison Illuminating Company, which later became the Detroit Edison Company. By 1891 he had left the farm permanently. Four years later he became chief engineer. While at the Edison Illuminating Company he met Thomas A. Edison (1847–1931), who eventually became one of his closest friends. Ford devoted his spare time to building an automobile with an internal combustion engine, a type of engine in which a combination of fuel and air is burned inside of the engine to produce mechanical energy to perform useful work. His first car, finished in 1896, followed the attempts, some successful, of many other innovators. His was a small car driven by a two-cylinder, four-cycle motor and by far the lightest (500 pounds) of the early American vehicles. The car was mounted on bicycle wheels and had no reverse gear. In 1899 the Detroit Edison Company forced Ford to choose between automobiles and his job. Ford chose cars and that year formed the Detroit Automobile Company, which collapsed after he disagreed with his financial backers. His next venture was the unsuccessful Henry Ford Automobile Company. Ford did gain some status through the building of racing cars, which resulted in the "999," driven by the famous Barney Oldfield (1878–1946). By this time Ford had conceived the idea of a low-priced car for the masses, but this notion flew in the face of popular thought, which considered cars as only for the rich. After the "999" victories, Alex Y. Malcomson, a Detroit coal dealer, offered to aid Ford in a new company. The result was the Ford Motor Company, founded in 1903, with its small, $28,000 financing supplied mostly by Malcomson. However, exchanges of stock were made to obtain a small plant, motors, and transmissions. Ford's stock was in return for his services. Much of the firm's success can be credited to Ford's assistants—James S. Couzens, C. H. Wills, and John and Horace Dodge. By 1903 over fifteen hundred firms had attempted to enter the new and struggling automobile industry, but only a few, such as Ransom Eli Olds (1864–1950), had become firmly established. Ford began production of a Model A, which imitated the Oldsmobile, and followed with other models, to the letter S. The public responded, and the company flourished. By 1907 profits exceeded $1,100,000, and the net worth of the company stood at $1,038,822. Ford also defeated the Selden patent (the legal rights given to a company or person for the sole use, sale, or production of an item for a limited period of time), which had been granted on a "road engine" in 1895. Rather than challenge the patent's legal soundness, manufacturers secured a license to produce engines. When Ford was denied such a license, he fought back; after eight years of legal action, the courts decided the patent was valid but not violated. The case gave the Ford Company valuable publicity, with Ford cast as the underdog, but by the time the issue was settled, the situation had been reversed. In 1909 Ford made the important decision to manufacture only one type of car—the Model T, or the "Tin Lizzie." By now he firmly controlled the company, having bought out Malcomson. The Model T was durable, easy to operate, and economical; it sold for $850 and came in one color—black. Within four years Ford was producing over forty thousand cars per year. During this rapid expansion Ford held firmly to two principles: cutting costs by increasing productivity and paying high wages to his employees. In production methods Ford believed the work should be brought by a conveyor belt to the worker at waist-high level. This assembly-line technique required seven years to perfect. In 1914 he startled the industrial world by raising the minimum wage to five dollars a day, almost double the company's average wage. In addition, the "Tin Lizzie" had dropped in price to $600; it later went down to $360. Ford was now an internationally known figure, but his public activities were less successful than his industrial ones. In 1915 his peace ship, the Oskar II, sailed to Europe to seek an end to World War I (1914–18; a war fought between the German-led Central powers and the Allies: England, the United States, Italy, and other nations). His suit against the Chicago Tribune for calling him an anarchist (a person who desires to change the existing government) received unfortunate publicity. In 1918 his race for the U.S. Senate as a Democrat met a narrow defeat. Ford's worst mistake was his approval of an anti-Semitic (anti-Jewish) campaign waged by the Ford-owned newspaper, the Dearborn Independent. When the United States entered World War I, Ford's output of military equipment and his promise to give back all profits on war production (which he never did) silenced the critics. By the end of the conflict his giant River Rouge plant, the world's largest industrial facility, was near completion. Ford gained total control of the company by buying the outstanding stock. In the early 1920s the company continued its rapid growth, at one point producing 60 percent of the total United States output. But problems began to arise. Ford was an inflexible man and continued to rely on the Model T, even as public tastes shifted. By the middle of the decade Ford had lost his dominant position to the General Motors (GM) company. He finally saw his error and in 1927 stopped production of the Model T. However, since the new Model A was not produced for eighteen months, there was a good deal of unemployment among Ford workers. The new car still did not permanently overtake the GM competition, Chevrolet, and Ford remained second. Ford's last years were frustrating. He never accepted the changes brought about by the Great Depression (a period in the 1930s marked by severe economic hardship) and the 1930s New Deal, President Franklin D. Roosevelt's (1882–1945) plan to help the United States recover from the Great Depression. He fell under the spell of Harry Bennett, a notorious figure with connections to organized crime, who, as head of Ford's security department, influenced every phase of company operations and created friction between Ford and his son Edsel. For various reasons Ford, alone in his industry, refused to cooperate with the National Recovery Administration, a 1930s government agency that prepared and oversaw codes of fair competition for businesses and industries. He did not like labor unions, refused to recognize the United Automobile Workers (UAW), and brutally restricted their attempts to organize the workers of his company. Ford engaged in some philanthropic or charitable activity, such as the Henry Ford Hospital in Detroit. The original purpose of the Ford Foundation, established in 1936 and now one of the world's largest foundations, was to avoid estate taxes. Ford's greatest philanthropic accomplishment was the Ford Museum and Greenfield Village in Dearborn, Michigan. A stroke in 1938 slowed Ford, but he did not trust Edsel and so continued to exercise control of his company. During World War II (1939–45; a war fought between the Axis: Germany, Italy, and Japan—and the Allies: England, France, the Soviet Union, and the United States), Ford at first made pacifist, or peace-minded, statements, but changed his mind and contributed greatly to the war effort. Ford's grandson, Henry Ford II, took over the company after the war. Henry Ford died on April 7, 1947, in Dearborn. Brough, James. The Ford Dynasty: An American Story. New York: Doubleday, 1977. Collier, Peter, and David Horowitz. The Fords: An American Epic. San Francisco: Summit, 2001. Kent, Zachary. The Story of Henry Ford and the Automobile. Chicago: Children's Press, 1990. McCarthy, Pat. Henry Ford: Building Cars for Everyone. Berkeley Hts., NJ: Enslow, 2002. Middleton, Haydn. Henry Ford: The People's Carmaker. New York: Oxford University Press, 1998. Weitzman, David L. Model T: How Henry Ford Built a Legend. New York: Crown, 2002. Just to let you know, Henry Ford was born in the Greenfield Township of Michigan, not Dearborn. Yes, the place he was born in is now Dearborn, but it was previously Greenfield. Also, in your last paragraph, you mentioned that Henry Ford did not trust his son Edsel to remain president and let Henry Ford II take over. This is not true. The reason Henry Ford II took over Edsel's position was because Edsel Ford died in 1943 during World War II. I think in my opinon this is the best article i have read.It gives you alot of info.